A black and white full page magazine advertisement published in the USA in 1928. 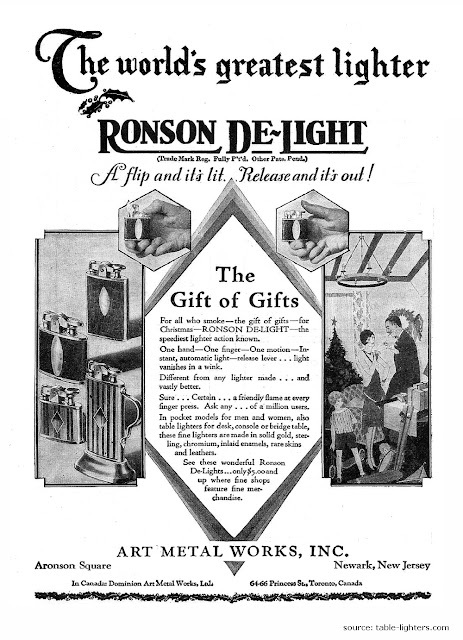 It features the De-Light lighter series made by Art Metal Works, Inc (Newark, New Jersey, USA). It is advertised with words like: "The World's greatest lighter", "A flip and it's lit. Release and it's out!" and "The gift of gifts". The gas table lighter Predom (Termet) GZS-03 was made between 1978-1988 in Pieszyce, Poland. 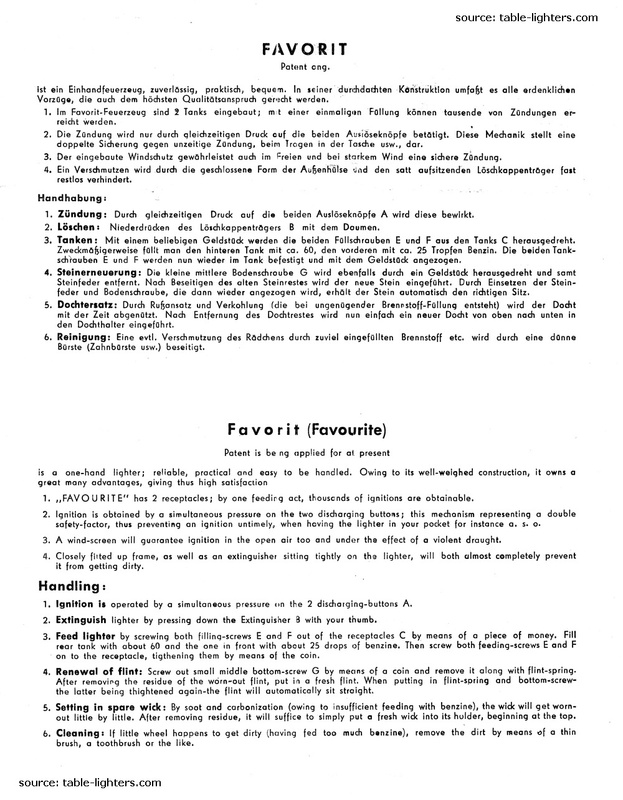 Predom (Zjednoczony Przemysł Zmechanizowanego Sprzętu Domowego) was a Polish corporation manufacturing a wide range of office and household products. 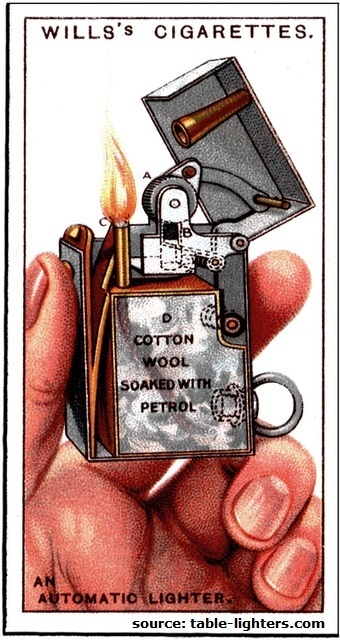 The "Termet" division was manufacturing gas-fired heaters, boilers, gas burners and pocket and table lighters. The base of the lighter is made of porcelain manufactured by ZPS "Karolina" (former Königszelt) which was founded in 1860. The base has a pearl finish with silver stripes on the legs. There are at least five other "Karolina" designs known. 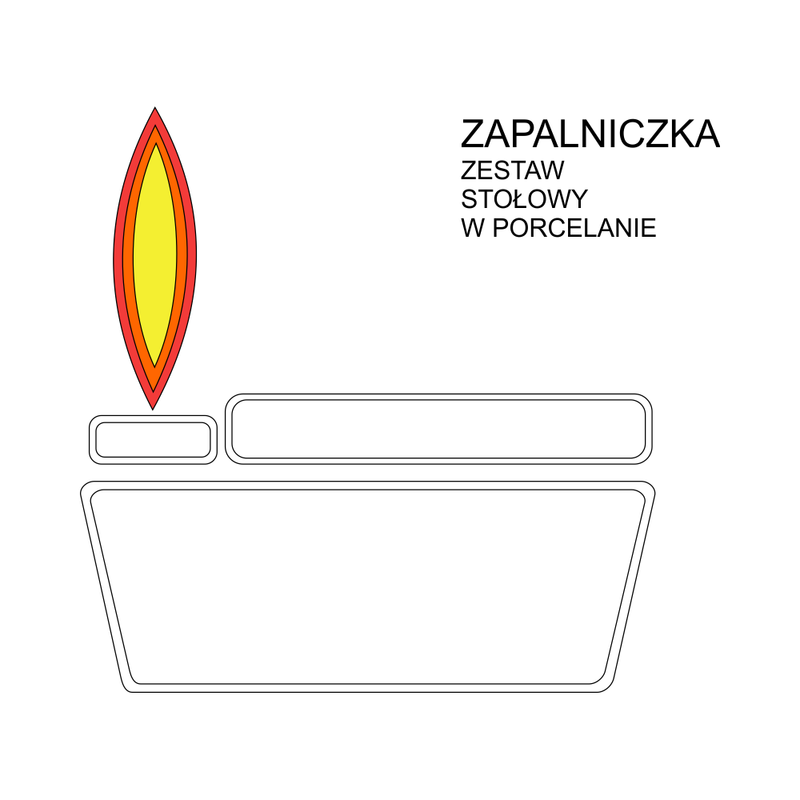 The base is stamped: KAROLINA, MADE IN POLAND, 1 (quality mark). 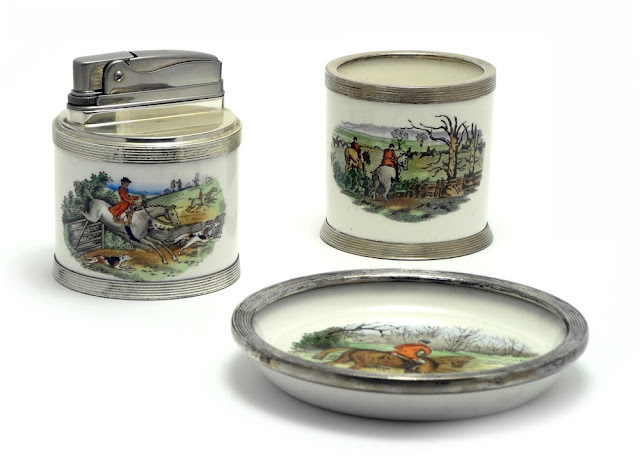 These lighters were also available in a set consisting of: lighter, cigarette holder and ashtray. 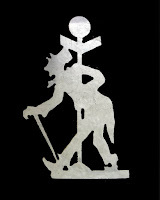 The lighter insert is chrome plated and stamped on the side: Predom Termet logo, gas model lighter GZS-03 and the month and year of production 10-82. The lighter insert was used in other versions than porcelain bases, like crystal glass and wood. 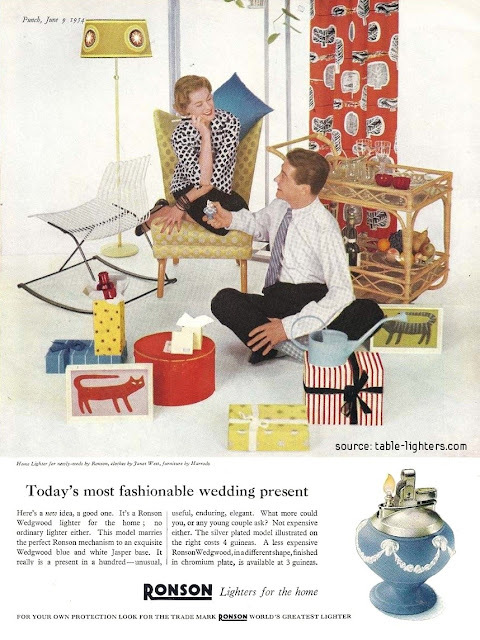 This Ronson magazine advertisement was published in a British magazine "Punch" in June 1954. It presents a Ronson table lighter in a Wedgwood blue and white jasper base as "today's most fashionable wedding present". This nice figural table lighter was manufactured between 1959 and 1961 in Japan. The base of the lighter is made of ceramic and is hand-painted. 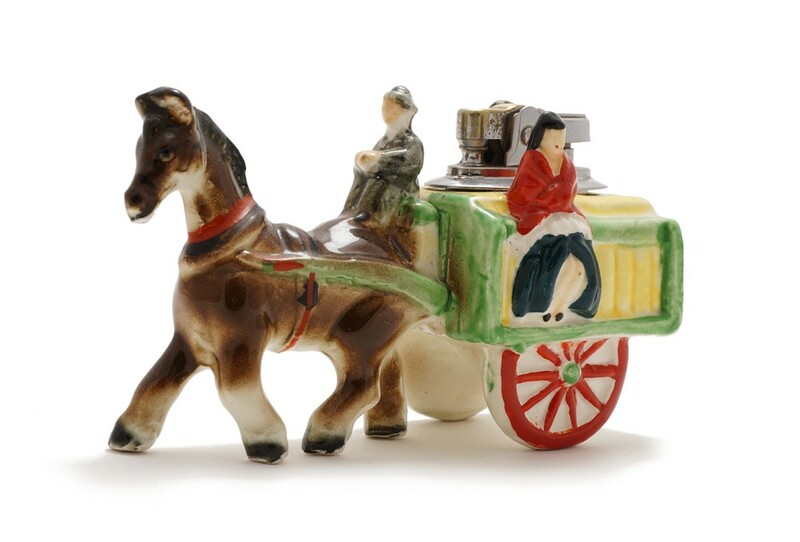 It depicts a Japanese horse-drawn carriage. Two people are sitting on the carriage - one person on each side - man and woman. Here we have an example of a color postcard from the WWII era. 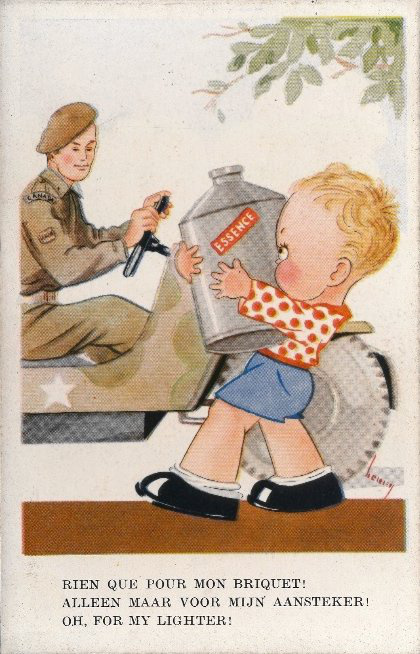 It depicts a small boy handing the Canadian soldier a can with petrol (fr. essence) for the jeep. In reply he gets this: Oh, for my lighter! A bit of humor in the very unhappy times. The postcard was printed in Belgium. The Ronson Striker Lighter "Monkey" was manufactured by Art Metal Works Inc. (Ronson) between 1938-1940 in Newark, N.J. in the United States. 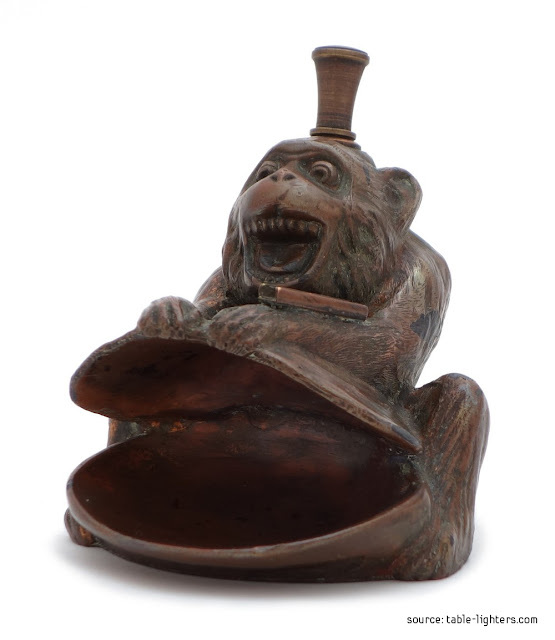 The same "laughing out loud" monkey design was also used in the manufacturing the Ronson AMW incense burner, but certainly without the wand and flint strip. The striker wand (two variants known) is on the top of the monkeys head and the flint strip on the arm. The striker lighter base is die-casted. It is therefor heavy and very sturdy. The finish is called "imperial bronze" - deep bronze effect combined with cooper-colored highlights. 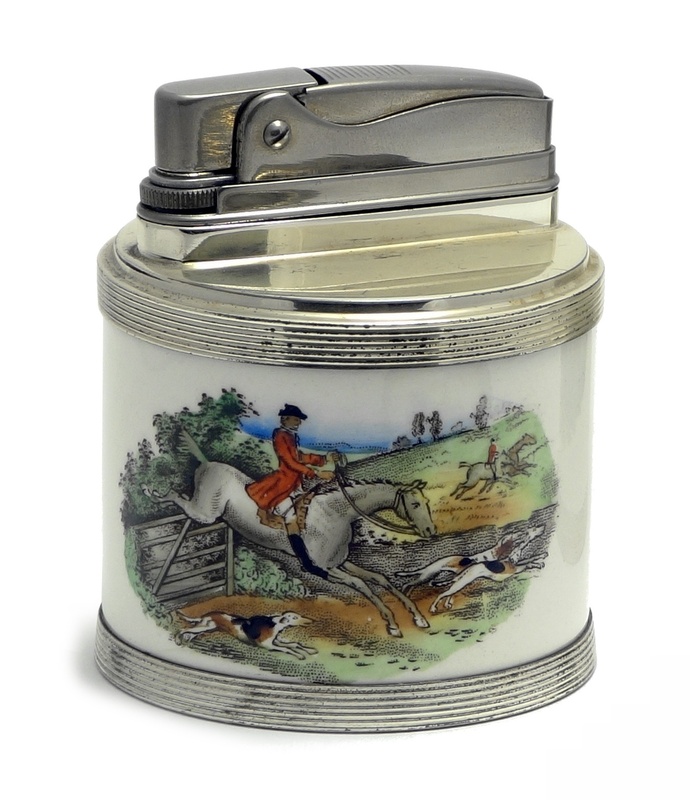 It was also made (but is rarer) in cooper finish The striker lighter combines a small ashtray compartment in a form of a clamshell. I am happy to start a new series of posts in form of interviews with lighter collectors around the world. I am starting with Eldon Baldwin a US citizen who not only has a stunning collection of lighters but also the expertise in making wonderful pictures of his finds. Enjoy! 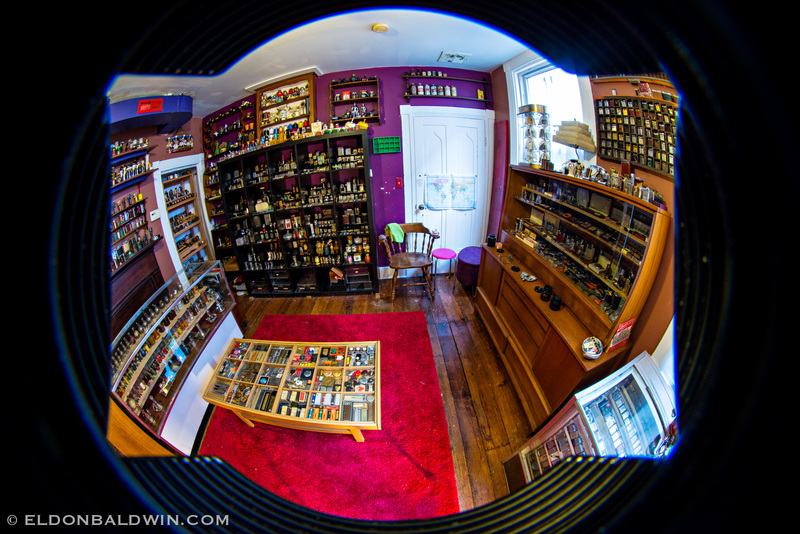 Your lighter collection owing to your excellent photographs is quite famous among the world. 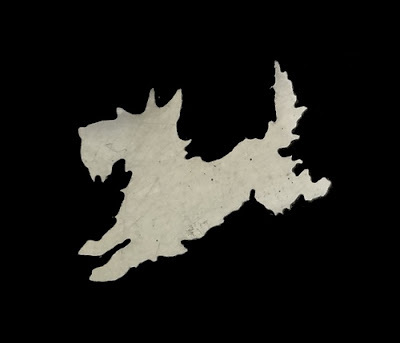 What is the story behind it? For me, it is a melding of two passions. I found my first vintage lighter at a flea market when I was 16, a sterling silver arm lift lighter made in Mexico during the 1940s about the size of a half dollar. 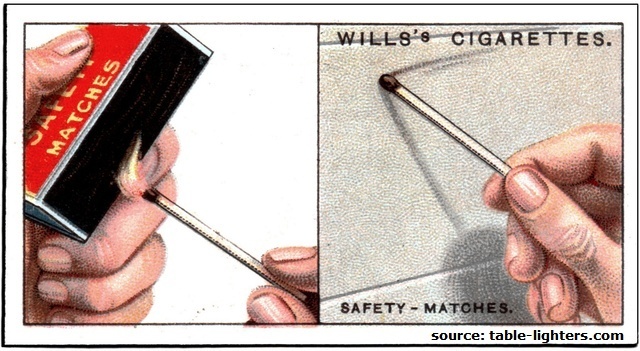 Up to that point, I'd only been exposed to Bics and Zippos and the idea that a cigarette lighter could be anything beyond a utilitarian means of lighting a smoke was a revelation. I fell in love with the uniqueness of the lift arm design. Its craftsmanship and durability was in stark contrast to the disposable and generic flip-top lighters sold in most convenience stores. That little silver lift arm was a work of art to me, a memento of a time in history when quality, elegant design, and affordable cost were not mutually exclusive concepts. 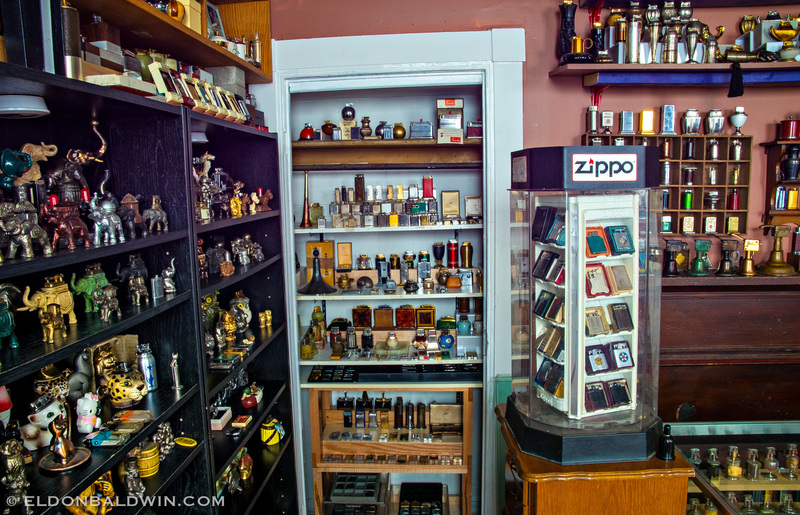 It set me on a path of seeking lighters everywhere: at local flea markets, antique shops, thrift stores, et al. This before was the internet and I didn't know books about vintage lighters even existed. So for me, every lighter was a new discovery. Coming to the hobby as a young smoker, of course I wanted to use my new acquisitions and I've been learning to fix lighters as long as I've been collecting them. At the same time, my interest in art was just beginning and I was experimenting with mixed media painting and sculpture. I learned the basics of B&W photography a few years later in college. In retrospect, I realize these parallel interests have followed me into adulthood and converged. Your collection is for sure very diverse. Can you give us an estimated number of lighters you possess? Is it expanding so dynamically as in previous years? And what is your major source of lighters? Really I can only guess. I'd estimate my personal collection is somewhere in the vicinity of 10,000 pieces. The number of lighters I possess is a lot higher, maybe 50,000 if you were to count every single broken piezo and Ronson/Zippo clone. I'd like to think I've grown a little more discerning with age, but I'm still a very active collector and love the "hunt" for new finds. Of course, the internet is where I buy the most these days. As the depth of my collection grows, it is getting a lot harder to find lighters I don't already have at flea markets around Baltimore. When you’re looking for lighters, do you look for specific models? And what’s been your most exciting lighter finds? I'm a very undisciplined collector, which partially explains why my collection is so extensive. I buy poor-condition and/or incomplete pieces for research purposes and possible restoration. I'll buy a cheesy inexpensive novelty lighter if it makes me smile. I have a few pieces I've bought because they were so ugly, I had to have them! On the other hand, I also have some incredibly rare pieces as well. 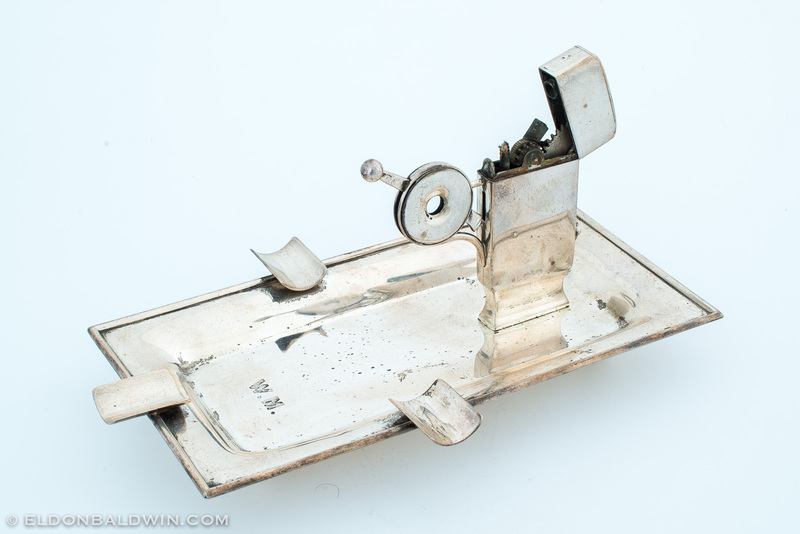 This sterling silver Hahway table lighter, cigar-cutter and ashtray combo is a current apple of my eye. 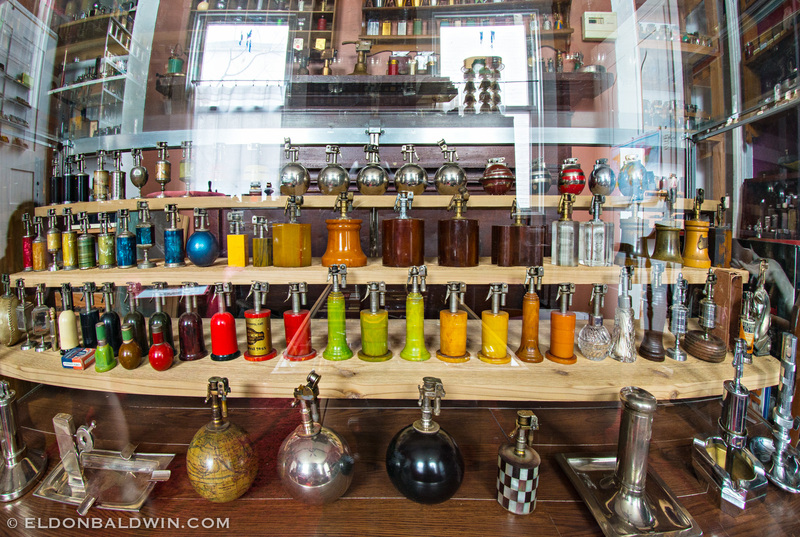 Have you ever thought about establishing a private museum on lighters? Your photographs could easily be used for an on-line museum I assume. Absolutely! I've been working on just such a website project for the last few years. Unfortunately, my aspirations for the site exceed my limited technical capabilities, so progress on the site development has been slow. I think I've finally found a reliable programmer to create the data management system for the site and we are slowly making headway. I hope the site will be ready to launch this fall. What is your collection for you personally? What is your dream connected with it? Lighter collecting began as a hobby and evolved into something Broader that encompasses many of my interests: research, writing, restoration, photography and other forms of creative expression. 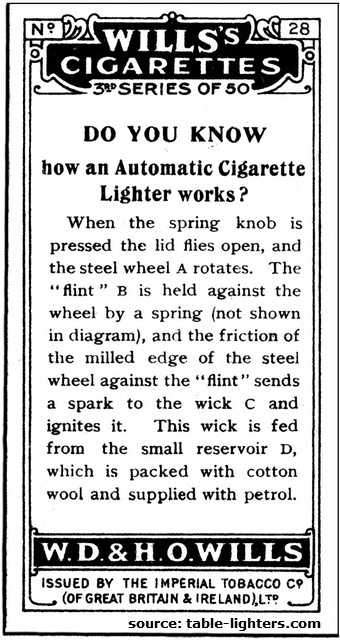 Accurately knowing when a lighter was produced, who designed it, what made it unique, where and how it was manufactured are all details I find fascinating. 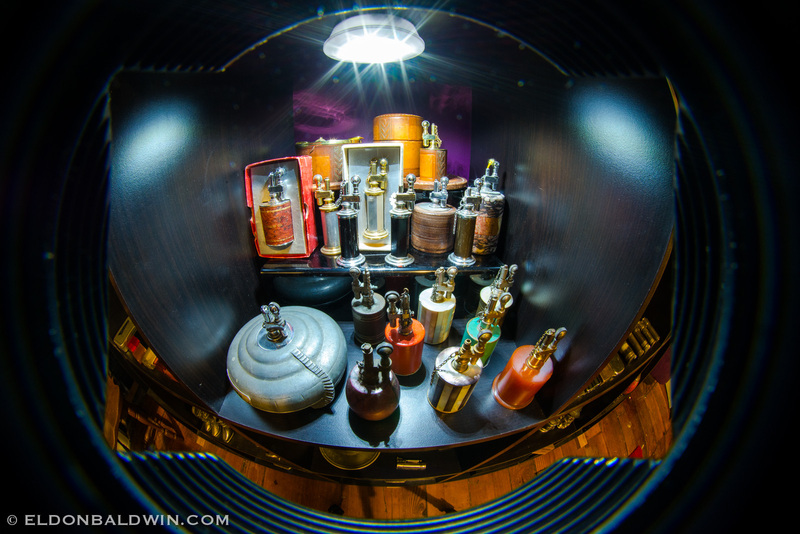 I try to keep my collection organized so it is useful for reference, that's a fun challenge unto itself. 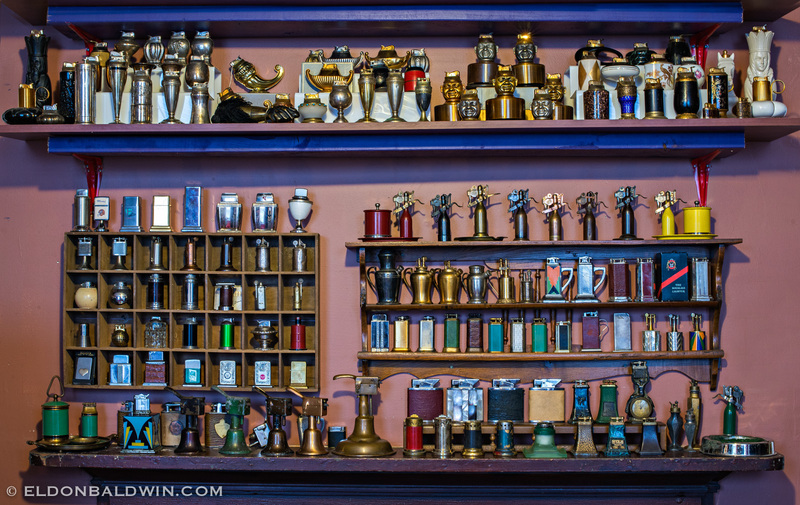 I suppose my dream would be for my collection to stay intact beyond my lifetime and become part of a permanent exhibit of vintage cigarette lighters at the Smithsonian in Washington DC. If you're gonna dream, why not dream big? It might be a difficult question but what is your favorite category of lighters? Could you also name your five favorite lighters in your collection? Lift arms and variations of the Marcel Quercia Briquet de Table Perfectionné design are probably my favorite lighter styles. These were two of the first 'unusual designs' I discovered as a kid at the flea markets and they're still the styles I seek most passionately. 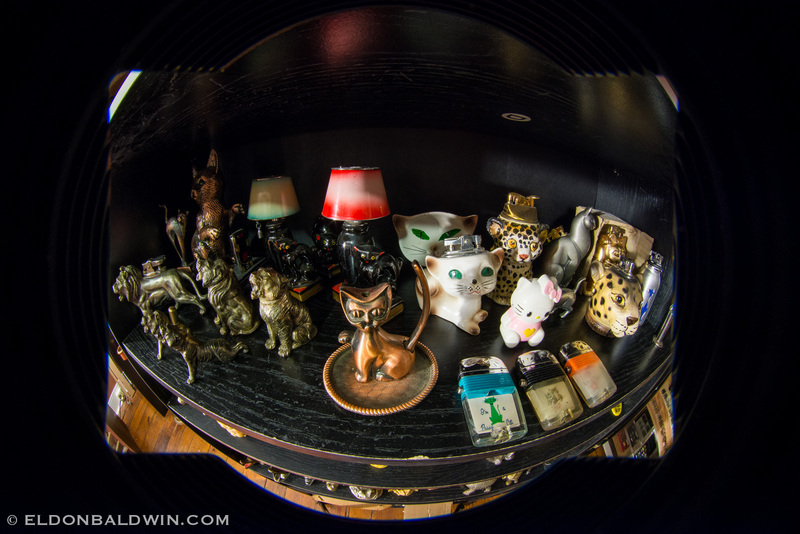 I have an ever-growing herd of animal lighters too, especially figural table lighters. Picking favorites is a lot tougher. I really don't have a true "Top 5"; maybe a "Top 50" wouldn't be so hard to pick. 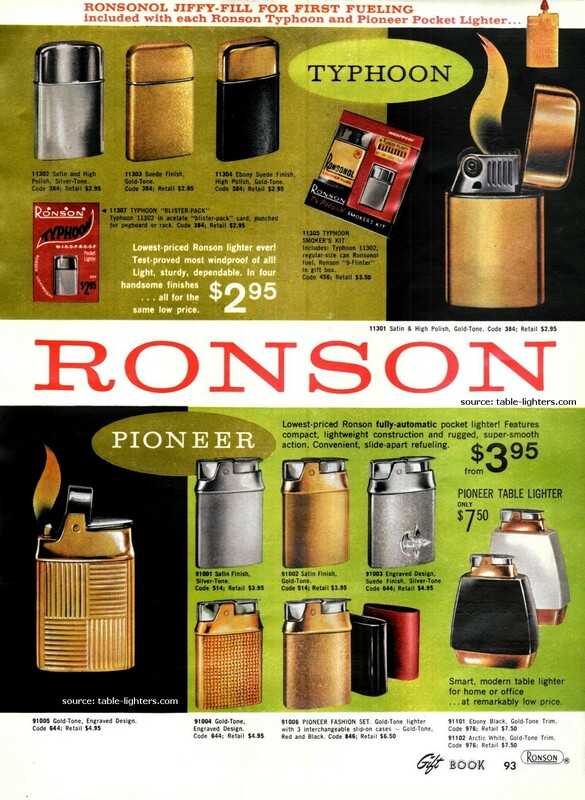 To make this easier for me, here are five of my favorite American table lighters in no particular order: Marathon Bridge and Rexlite lift arms, the Brown & Bigelow Pull-Chain, Guinn cigar lighters, and the Capitol. Can you give novice lighter collectors any hints regarding collecting lighters and photographing them? 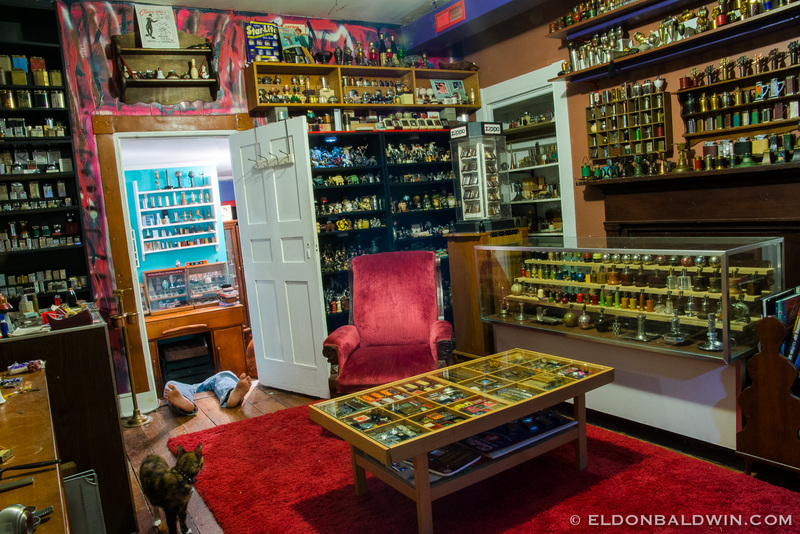 The best collecting tip I can offer has been shared by many experienced collectors before: Learn about what you love to collect. 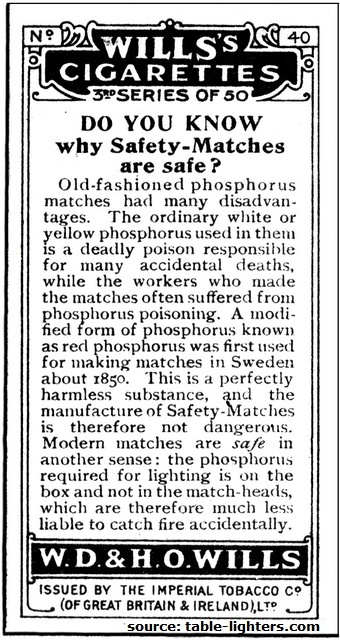 The more you know about a lighter, the more you can appreciate its history, provenance and value. At least for me, the joy of lighter collecting it two-fold: the excitement of the hunt, then the quest to learn about the new find. A couple of photography tips for lighters come to mind. Avoid using a flash. A tripod makes it a lot easier to compose shots and fine tune the lighter placement to reduce distracting reflections. Natural sunlight is easiest to work with, especially with lower quality cameras and personal devices. If you are serious about taking nice quality photos, investing in an inexpensive light box will make photographing chrome lighters so much easier. Thank you Eldon for your time. It was a pleasure to talk with you! I hope we may soon see your impressive collection of lighters at the Smithsonian in Washington DC. More pictures and information about Eldon Baldwin can be found on his webpage! 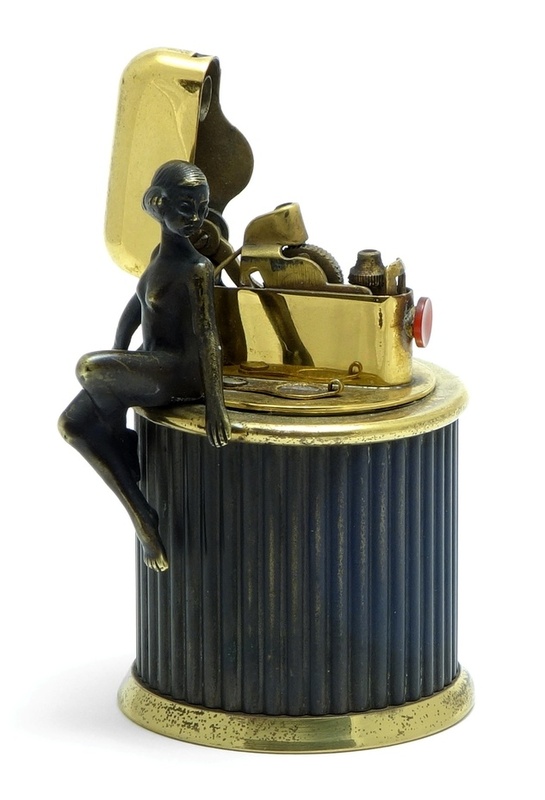 A beautiful Thorens Table/Desk Lighter was recently sold on eBay for a modest $350. The auction received 27 bids from 18 bidders. The wick desk lighter is a rare piece coming from the late 1920s. 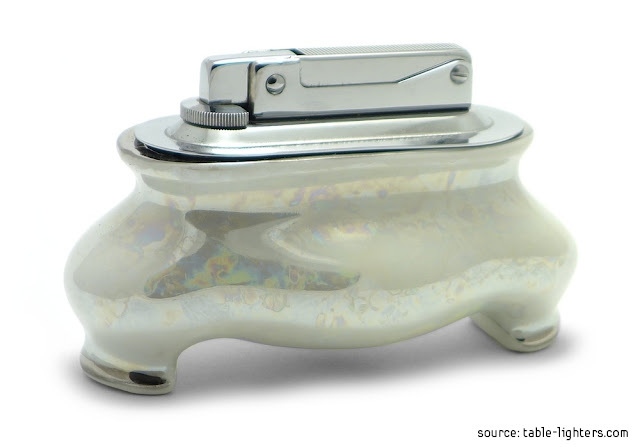 The lighter insert is a Thorens 'single claw' type that was manufactured between 1918 and 1935 in Switzerland. 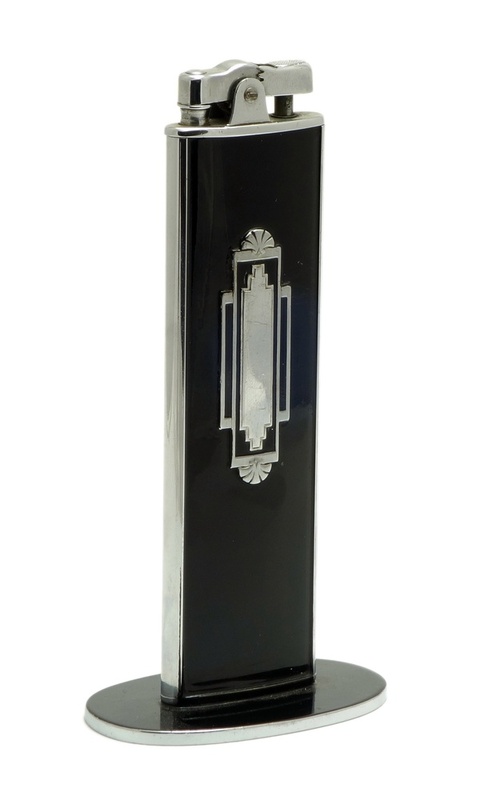 The gold-plated base of the lighter is very unusual - a Scottie dog is leaning against a column. Perfect design! And here some additional photos from the seller. 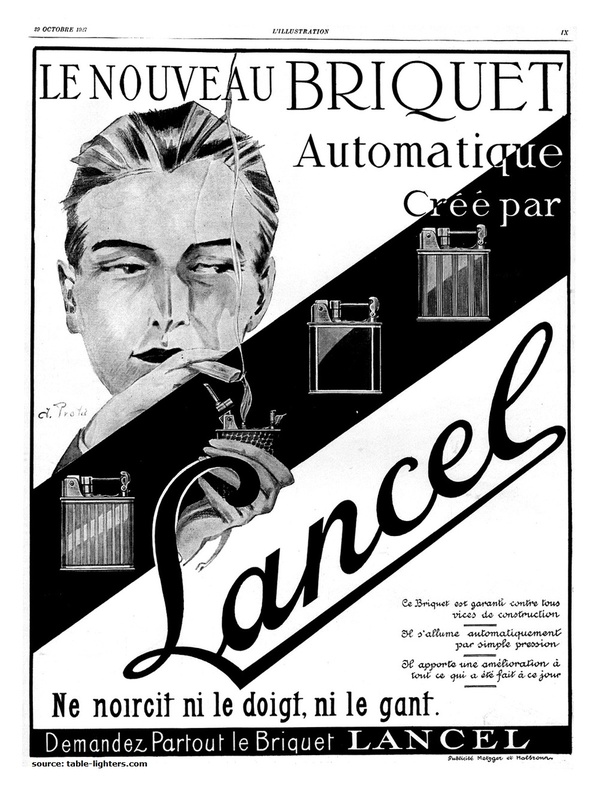 This full-page black&white Lancel advertisement was published in October 1928 in a French magazine called L'Illustration. A nice example of Art Deco graphic design. 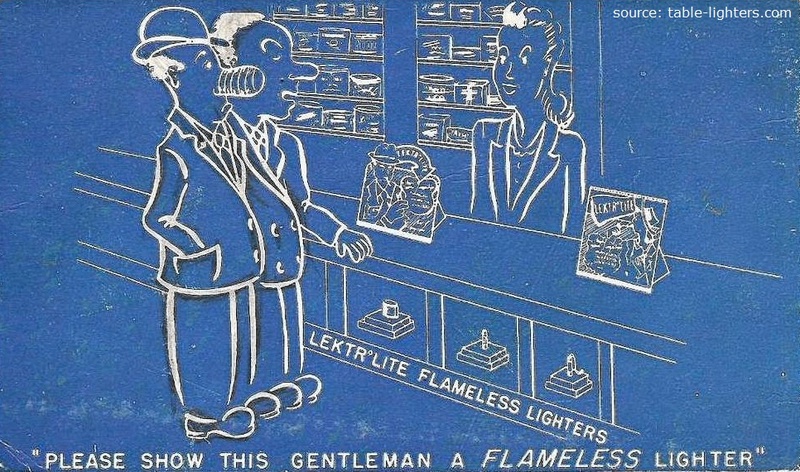 This humorous "LektroLite Flameless Lighters" postcard was in circulation in the late 1930s/ early 1940s mainly in the United States. What a good way to promote products! 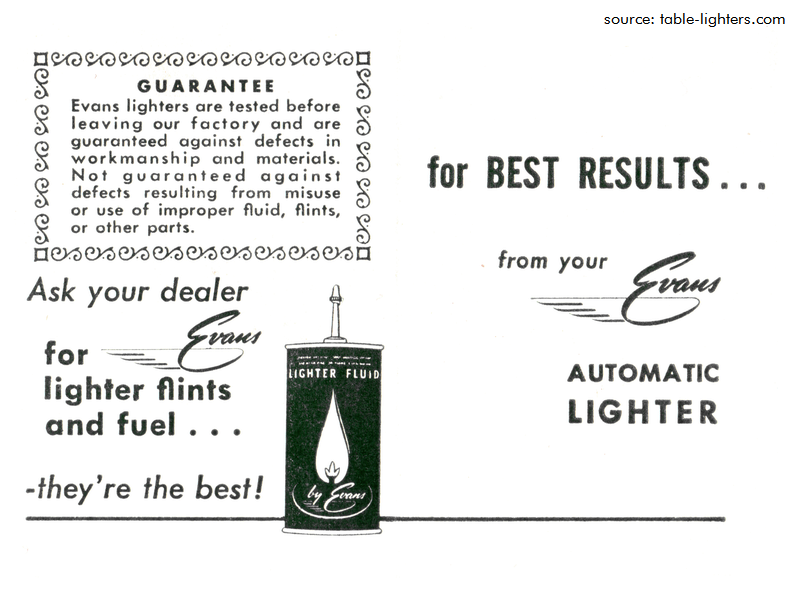 This six-page promotional leaflet was found in a box from a table lighter made by Evans Case Company in the late 1940s. It features "smart new designs" of table lighters, Liter-Case combinations and pocket lighters. 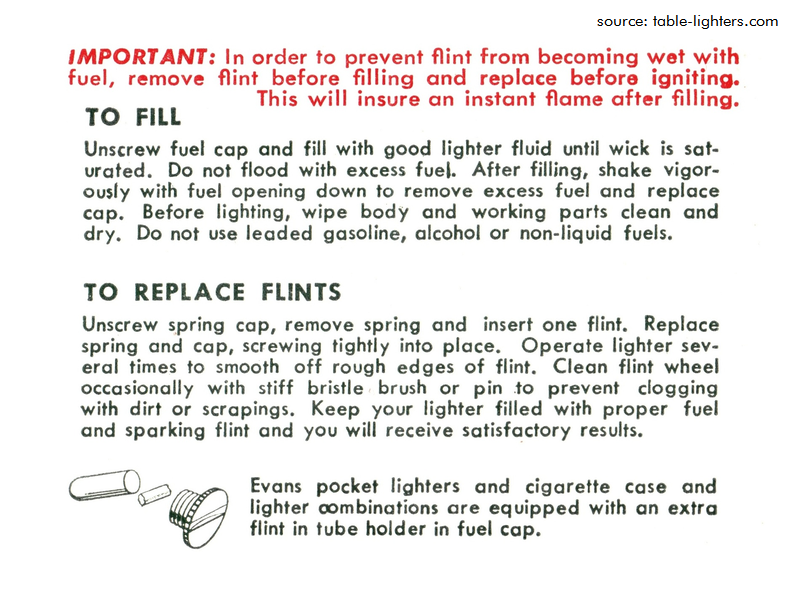 This small instruction leaflet was added to all new Evans lighters in the mid 1940s. After five hours of work I have just finished to digitize the Ronson Catalog from the 1938. I must admit that it looks great. 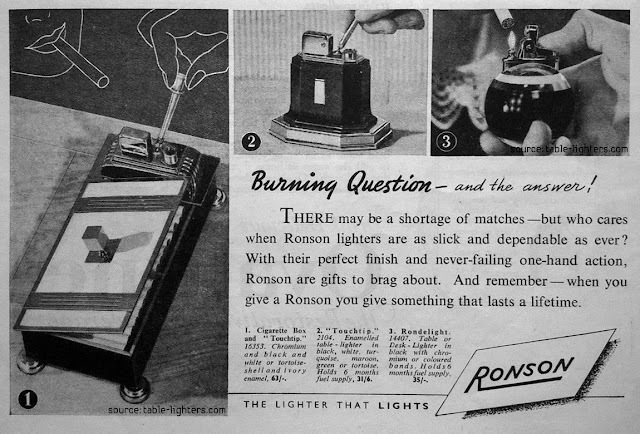 It covers the whole range of Ronson cigarette table/desk, combo and pocket lighters made that day. 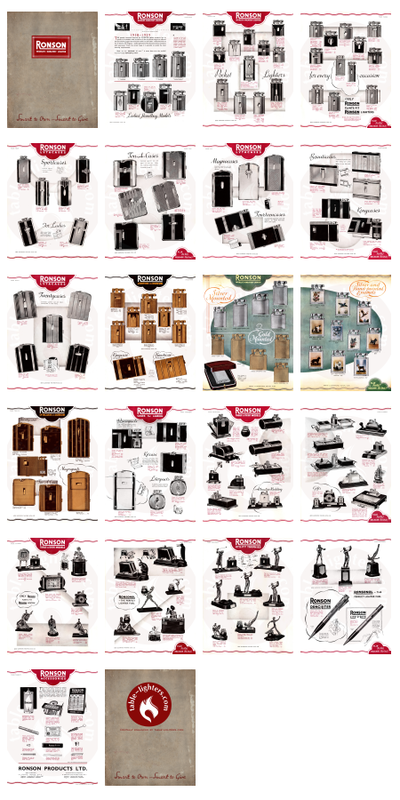 Approximately 150 lighters are described and illustrated in this 20-page catalog. A must have for every lighter collector! 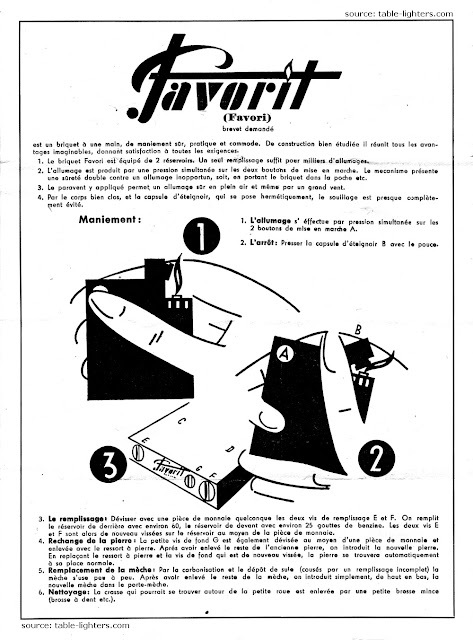 Please make a donation of $5 and you get this and couple of other publications on lighters (for instance: Lighter Repair Manual) in PDF delivered to you by email! Thank you! 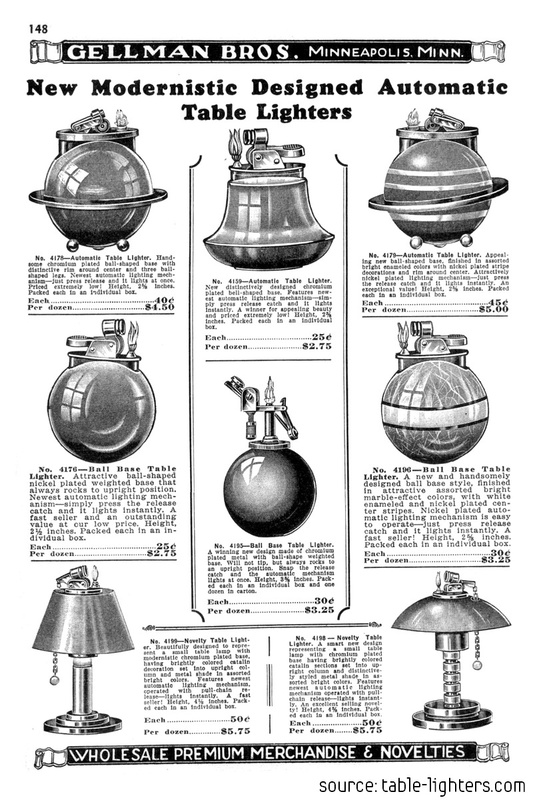 Fine examples of cigarette table/desk lighters from the Gellman Bros. catalog from 1938. 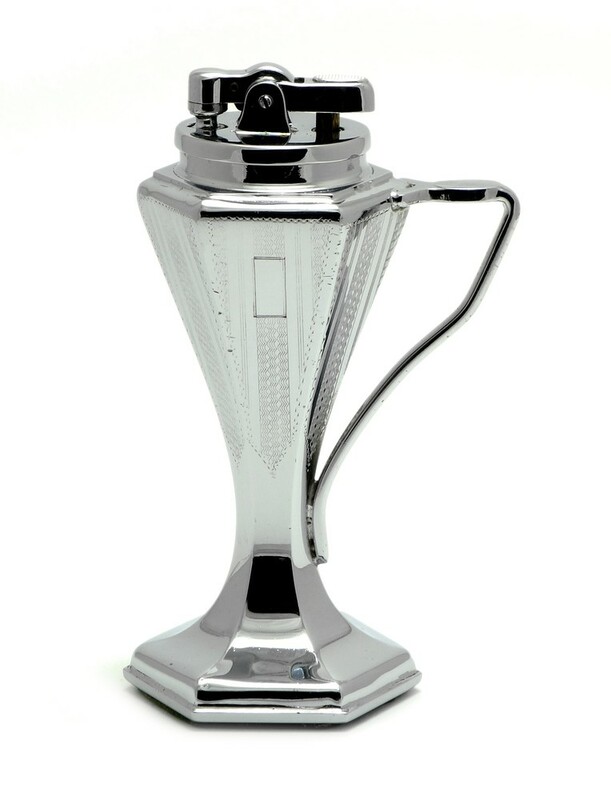 Featured are several "new modernistic designed automatic lighters" mainly chrome and nickel plated.